All Hindu divinities have benign and wrathful aspects. Although Shiva is primarily responsible for destruction, he has peaceful manifestations too. 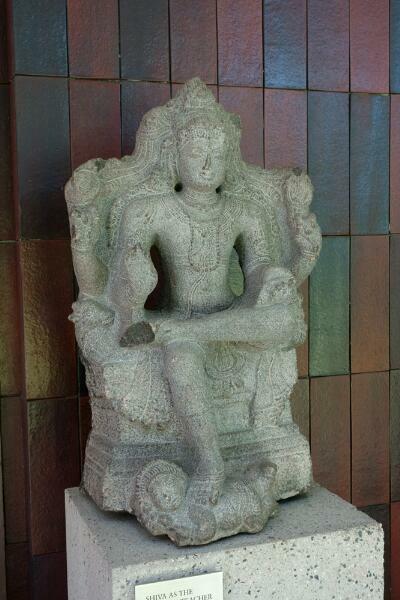 This sculpture represents one of them—the supreme teacher. Unlike the Buddha, who is also shown as a teacher, Shiva is an ascetic teacher whose divinity is expressed by his four arms. In his upper right hand he holds the rosary (an ascetic’s emblem)… and in his upper left, a flame (representing knowledge), or sometimes, a trident. The lower left hand holds a barely visible palm leaf manuscript… and the remaining right hand with broken fingers once displayed the gesture of teaching. The dwarfish figure forming his footstool is said to signify ignorance. Although carved from granite, a very hard stone, the sculpture is noteworthy for the figure’s naturalistic but unusual seated pose, and for its many fine details. Look, for example, in the elaborate loops of Shiva’s distinctive matted hair. On the left is a curl representing a snake.